The Fisher family was desperate to find a last minute deal. With school holidays due to start, what were the options? This year, the Fisher family ski holiday was on hold, while we waited for news on heart surgery for one of our grandparents. Moreover with older teens on board, and the added issue of restrictions on taking children out of school, our family ski trip was soon restricted to a very narrow peak-holiday window. So, this year we were going for a last minute holiday deal, very last minute. NHS waiting lists had eventually given us a date of early February, with a 7-10 day recovery period, suffice to say, the op went well and we had the all clear to leave the grandparents ‘home-alone’. Thus a hasty last minute ski booking to make. We had been keeping an eye on availability. Among the limited choice that was still available and within the family budget we could see a choice of two – a chalet in Grimentz, a Swiss ski resort I had skied before from the Zinal side, or a chalet in Alpe d’Huez with Zenith Holidays. The prices were comparable, the ski areas vastly different, however it was the flights & transfers that became the deciding factor. Grenoble flights were still available at an affordable price and with Zenith Holiday bookings, a minibus transfer was a welcome option for a small extra fee. Via Geneva, the flight would give us just 30 minutes to catch the last ongoing Swiss train – way too stressful with 3 children in tow. 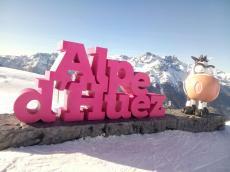 I must have stayed in Alpe d’Huez around 18 years ago and was keen to return. Zenith still had a chalet in the old part of town available and with the flights booked, transfers confirmed…. our holiday was booked! We had a mad dash to get the ski kit out of the loft and packed. There were the usual hiccups in resort, where we realised, that the older teen’s ski pants were way too short and way too tight. Thankfully, Intersport, where we rented our skis, had some reasonably priced ski pants that we bought (compared to the chic, expensive Sun Valley store opposite with ski pants starting from 275 euros). It was difficult to know if they’d keep the boy dry if it rained, but with wall-to-wall sunshine forecast, in the end they were perfect. Alpe d’Huez ticked all the boxes for us. Each morning we made an effort to get out of the chalet early to avoid the peak time queues, and once on the mountain, it was easy to find the less busy sectors. On another day we tried out the luge with the fun new VR head kits which we all loved. One day we challenged ourselves to ski from the highest point at 3,330m to each end of the ‘Grand Domaine’. Our challenge started with the Sarenne. Well we actually started just below the top as the youngest wasn’t quite up to the steep black section off the Pic Blanc cable car, but from the top of lift Marmottes 3 there is an easier blue which evolves in to the long winding black run. Spectacular views of the Grandest Rousse mountains accompany you down the 16km run ending in the Sarenne Gorge. Then from Auris with clear views over to Les 2 Alpes, we zigzagged our way over to Vaujany and the furthest Montfrais chair and all the way back via Oz and on to the Signal sector. Down to Villard Reculas then back up and down to the gorgeous old bubble lift at 1450m which brings you up from the original old village at Huez, almost straight to our chalet. We even managed to go night skiing to really extend the ski day! That posed a little problem, but then, Zenith Holidays literally came to our rescue. As we went back out to catch the bucket lift up to night skiing on Signal, we discovered it had just closed – and there was no sign of the nightbus. All week the Zenith rep, Maddie, had been saying, “if you need me, just call me”. So we did… and she came to scoop us up. It was an easy ski back to the chalet – we were so grateful for her minibus ride and not having to walk the 20 minutes up to the nightski area. During our stay, Alpe d’Huez hosted Tomorrowland, a huge new Alps festival and the stages and marquees were going up around the village. In Alpe d’Huez some of the lifts have been upgraded. Many older wires and 130 redundant pylons have been removed. The mid week ESF show was spectacular and probably one of the best I have seen. When, and if the link to Les 2 Alpes goes ahead the ski area will rival the best in the Alps. Zenith Holidays offers a week in Alpe d’Huez in Chalet Maya from £503pp chalet board.